Could Wyoming's Tanner Gentry be a late-round fit for Pittsburgh? Pittsburgh quarterback Ben Roethlisberger attempted the most deep passes in the NFL last year as he had 86 attempts that travelled at least 20 yards in the air. Furthermore, Roethlisberger had the highest ratio of deep attempts as 16.9 percent of his attempts went further than 20 yards from the line of scrimmage. 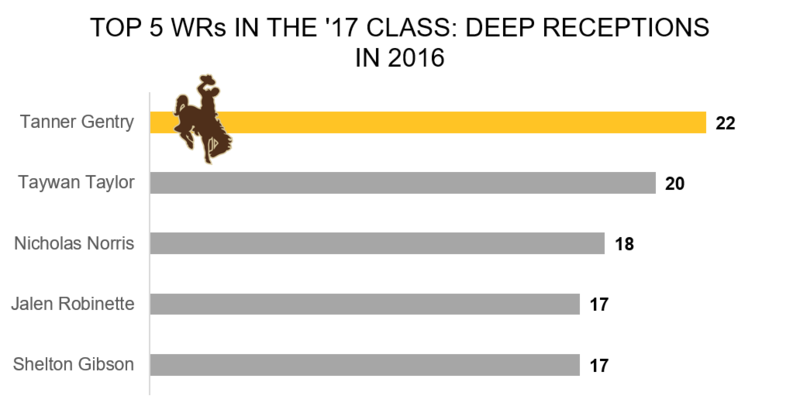 Wyoming wide receiver Tanner Gentry saw the most deep targets in college football in 2016 with 49 such targets and he also led all wide receivers with 22 receptions on these passes. In addition, 40.2 percent of Gentry’s targets came on deep passes and he was tied for the fourth most touchdown receptions on such passes with 10.